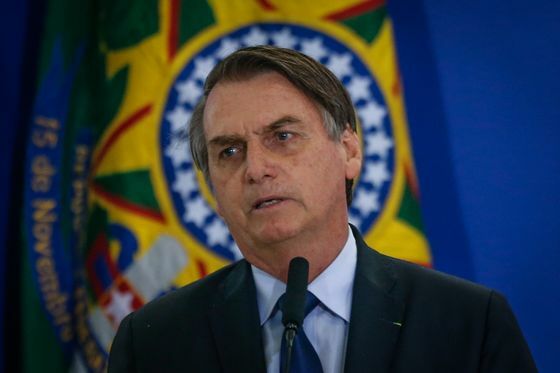 (Bloomberg) -- An opinion poll shows Jair Bolsonaro is facing the lowest approval rate for a first-term Brazilian president through 100 days among all elected predecessors since the country’s return to democracy in the late 1980s. The former army captain’s government was described as “bad” or “terrible” by 30 percent of respondents, almost as many as those rating it “good” or “very good,” according to a Datafolha poll published Sunday on Folha de S. Paulo newspaper. That makes Bolsonaro even less popular than Fernando Collor de Mello, the former president who in 1990 seized bank deposits shortly after his inauguration. Bolsonaro has faced a series of problems in his first three months in office. While he’s lauded by investors for forming a market-friendly economic team led by Paulo Guedes, the government has failed to forge a working majority needed to approve a drastic cut in pension outlays in Congress amid sluggish growth and persistent high unemployment levels. Instead, the far-right politician has exacerbated the country’s ideological divide preferring skirmishes of cultural warfare over the hard slog of political negotiations. More than 60 percent of Datafolha respondents said Bolsonaro has performed below expectations. “Bolsonaro needs to fit the job and show work” to get more support, Datafolha director Mauro Paulino said on Twitter.